Anchoring for everyday solutions to your most demanding jobs! ITW Red Head announces the addition of C6+ and G5+, two new adhesives to the anchoring line. C6+ is designed for use in the most demanding anchoring applications and is backed by ICC-ES approvals for both concrete and masonry. With various state DOT approvals and ICC-ES Concrete Approval, G5+ is an everyday epoxy that is a great option for end users that want reliable performance but don’t require the maximum strength of C6+. The new Red Head A7+ allows you to post-install threaded rod and rebar in the widest range of applications and environmental conditions. Its all-weather formula makes it ideal for outdoor civil infrastructure projects and other jobs involving wet jobsite conditions. It can be used for structural and nonstructural anchoring in concrete, hollow and grout-filled block, and brick— making it perfect for construction and renovation projects employing mixed substrates. 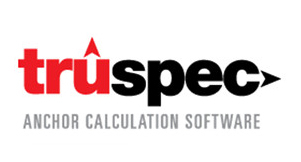 Introducing Red Head's newest and easiest to use anchor calculation software, Truspec 2.0! Our new version features real-time 3-D animations and user-friendly navigation with guided support so structural design engineers can easily design post-installed concrete anchoring connections in accordance with ACI 318.